It may seem surprising, but the most complex repairs in the apartment repair is considered to be in the bathroom. And after all the labor-intensive stages of repair, before many the question arises, what to do with the ceiling. 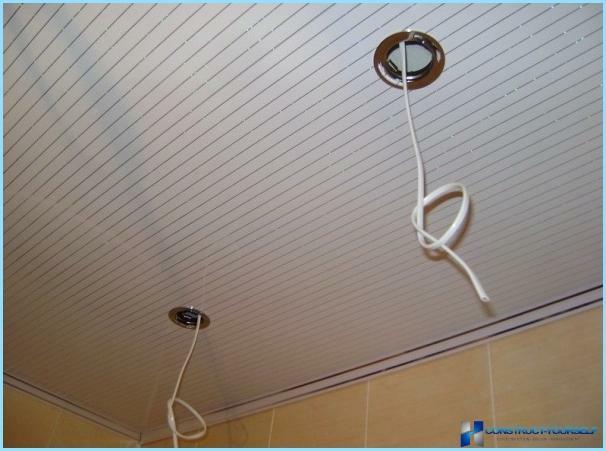 Currently there is a huge choicea variety of ceiling structures, but it was suspended ceilings for a bathroom is considered one of the most popular and trusted solutions. In this article, we'll show you how to perform a self installation of a rack and pinion design. 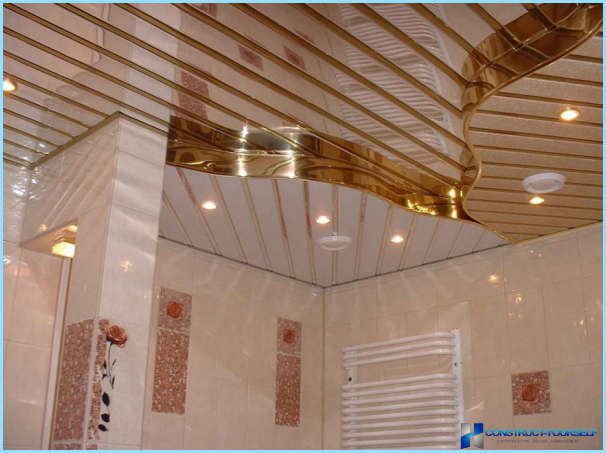 Ceiling rack design ismodular ceiling structure which is suspended from the ceiling to the base. It will not only cover all communications in the bathroom, but also will serve as a decorative element. Thanks to aluminum, the design easyIt is set to traverse without using fasteners. 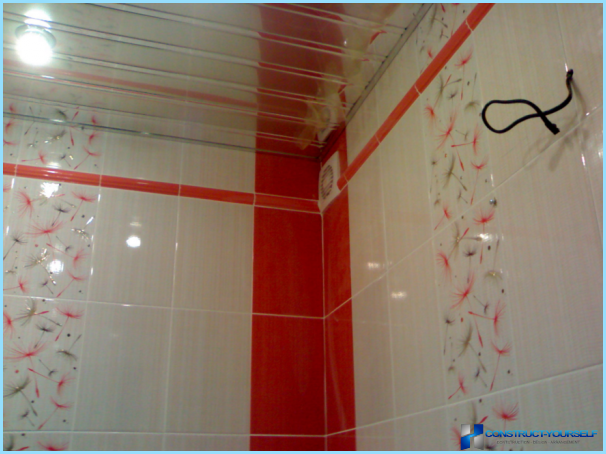 To the ceiling in the bathroom look more elegant and attractive, between the rails attached special insert (layout). That they give to all suspended ceilings presentable appearance. When choosing a rack design should be given to aluminum panels. They must be tightly packed into the film, no scratches or other defects. Length. As a rule, the standard panel size of 4 meters, however, can occur and a 3-meter rack. Thickness. When choosing aluminum panels for rackthe ceiling, do not ignore this option because it was from him will depend on the strength and reliability of the entire structure. The optimum thickness of the slats should not exceed 0.5 mm. This amount would be sufficient to design not slack, not bent and hold the shape perfectly. Rack ceiling with inserts. 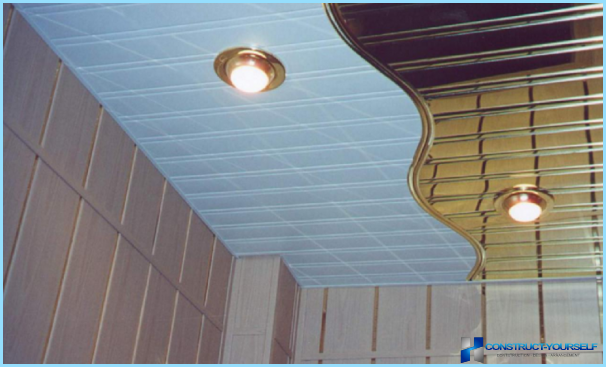 By type of a ceiling in the bathroom resembles an open look, but the gap is closed by narrow strips of aluminum. 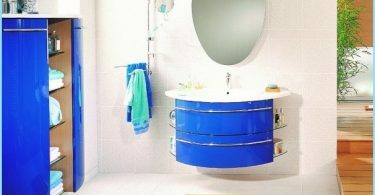 It is this type ideal for the bathroom. Knowing about all the advantages and disadvantages of rackdesigns, the choice will be much simpler and easier. 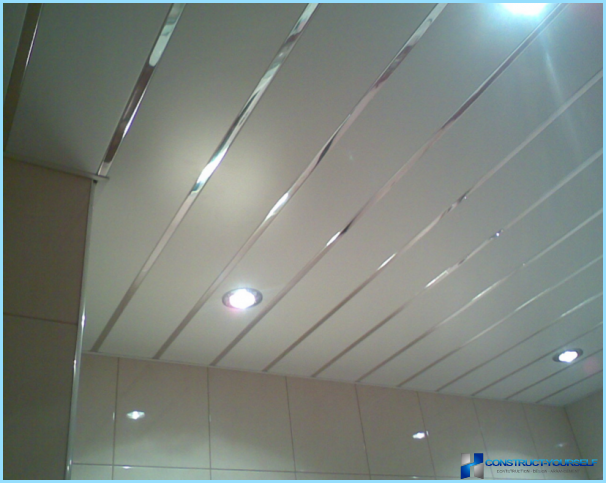 Moreover, the performance of each will be able to visually compare with other ceiling designs. Environmentally friendly. Only high-quality eco-friendly materials are used for the production of slatted panels. Attention! Thanks to eco-friendly materials of construction for the rack design, the ceiling is not formed fungus, bacteria do not multiply. podpotolochnye rack space design can hide the various communications. Speaking about the benefits of rack ceiling,It must be said about his shortcomings. 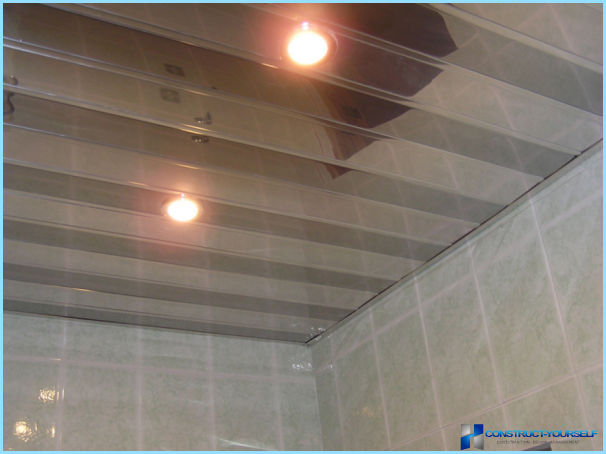 Alas, the only drawback of suspended ceilings - is the reduction of the height of the ceiling in the bathroom. However, any ceiling structure has the inherent lack of it. Before going to the store or to the construction marketbe sure to measure the width and length of the bathroom. Ask why? Everything is very simple. 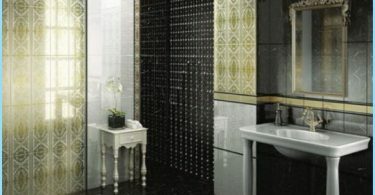 Size of the bathroom can tell how much of the necessary material you should buy, and how to choose the length of the panels. In addition, do not forget the corners for decoration, suspensions and tires. Installing a new ceiling in the bathroom, does not require specific skills and craftsmanship. 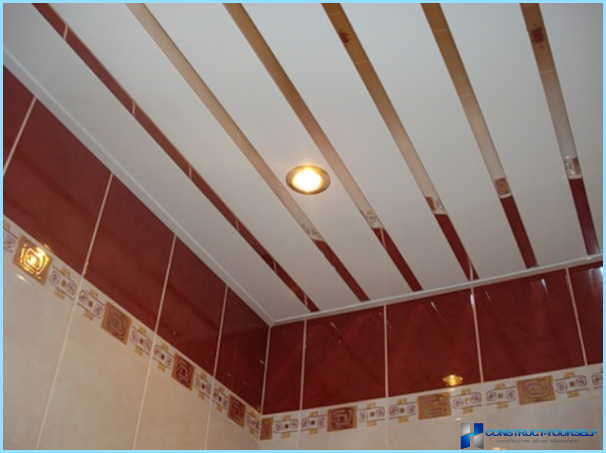 Therefore, we consider all the main stages of installation of the ceiling on its own. First step. 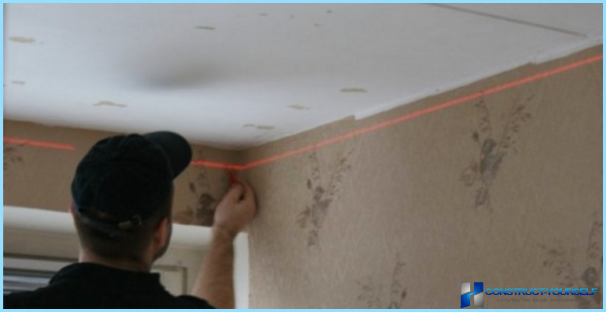 Before making any measurements, you need to determine a mark for the future design of the ceiling. It should be taken into account: the size of all communications that are hidden between the base and the ceiling of the new rack design, the thickness of the air and stands for lamps. Important! From the base to the ceiling rack design, the distance should be at least 5 centimeters. Second phase. Using a building or a laser level, from the level assigned, you need to make a layout on the perimeter of the entire room. Third stage. 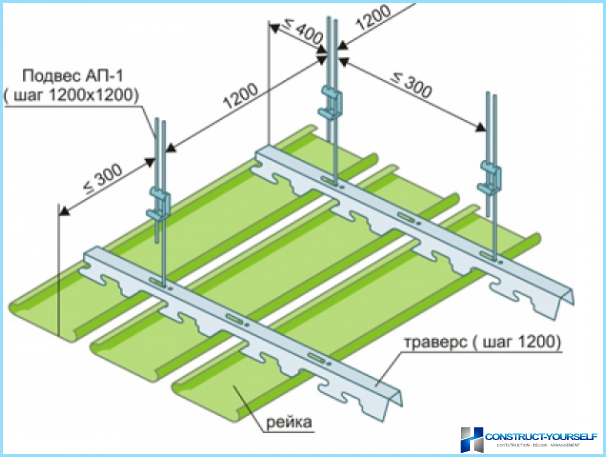 Determine the direction of the ceiling structure must be set perpendicular to the support rails. should not be more than 120 cm between them. The fourth stage. In the old ceiling, departing from opposite sides of 30 centimeters, it is necessary to note two lines. If the distance between them will be more than 100-120 centimeters, it is necessary to draw another line, at the same time sustain the required distance. Typically, enough bathrooms standard two or three tracks. Just counting is done on the perpendicular line. The fifth stage. Many might ask: "Why all these lines." 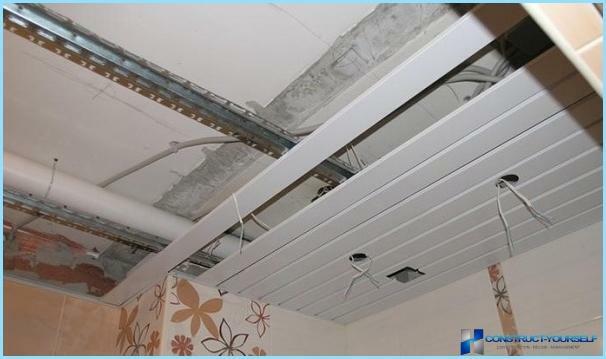 The thing is that due to such manipulations possible to determine precisely the point of attachment to suspensions, which further allows you to quickly carry out installation of suspended ceilings in the room. In marked points is necessary to make a hole, the diameter of which should not exceed 6 mm, then the whole ceiling construction fasten hangers-clamps. The sixth stage. Today on the Internet you can find any video associated with the installation of suspended ceilings. If you have searched for at least one, you probably noticed that the perimeter is a decorative area. Installation of such elements is done on previously the marked perimeter. The distance between the fastening elements as necessary to keep 30-40 cm. Fixing decorative corners must be performed alternately, using screws and dowels. The seventh stage. Using tin snips, cut the need to guide the required length, leaving the special lugs for fasteners. Important! 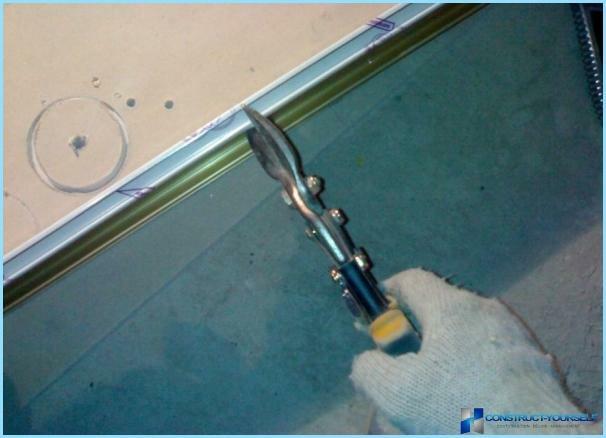 You can not cut the guide on the side, which will start the installation of the panels. The eighth stage. Expanding rails perpendicular direction necessary, secure them on hangers. Installation of the frame is completed. before mounting a new ceiling in the bathroomroom, it should include the spotlights. 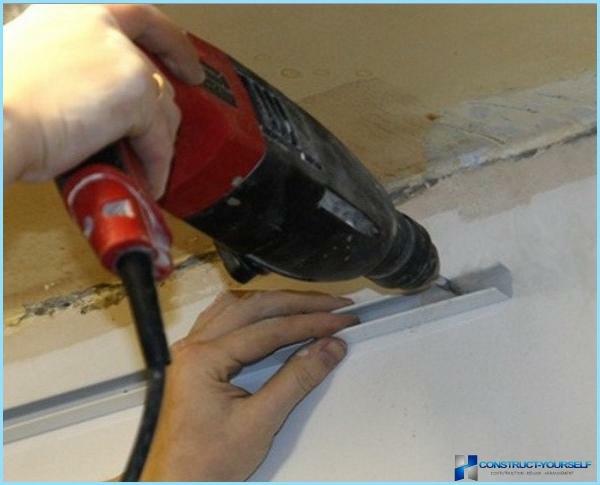 In order to do this, in the panels is necessary to drill holes of the required diameter, and then insert the lamp. Panel attached to the base and the ceiling connect the luminaire. If the last rack width does not fit, or you need to go around the corner, the only correct solution is to cut the length of the panel. Important! Due to the fact that the ceiling panel to the rack made of aluminum, the panels are easily cut with scissors for metal. In order to cut the panel with its innerthe parties need to make the cut mark line. To make a mark building level or range, and then draw a line and make an incision a sharp metal object. From the side of the cut to the required line, doperpendicular incisions, the distance between them should not exceed 12 cm. After the severed part can be broken off. Line cutting is smooth and level. As you can see, setting the ceiling for its rackhand does not require much skill, skill and professionalism. All necessary tools and materials can be found in specialty stores and construction sites. A detailed installation manual you already have.